Born of the idea that man's destiny was largely the result of his own effort and imagination, the United States of 1792 had grown to fourteen states with the addition, in 1791, of Vermont. The army, of about 5,000 men, was fighting Indians in the Northwest Territory. The nation had no navy and paid an annual tribute to the Barbary Pirates. The migration West had begun. Due to the long standing trade relationships with the Spanish possessions of Florida and Louisiana, Spanish silver were the most common silver coins in circulation, followed by the English shillings and pence of the mother country. Because of the incompatibility of the Spanish and English monetary systems, the conduct of business, trade and everyday life was burdened with the need for intricate conversion tables. Accounts were, of necessity, kept both in English pounds and Spanish reales. Confusion was immense. Action was called for. The need for a rational system for United States coinage received the early attention of Congress. Benjamin Franklin, Thomas Jefferson and Alexander Hamilton all strongly favored adoption of the decimal system. They argued that the decimal system represented a clean break with the past and was the most scientific way to reconcile the differences of the Spanish and English monetary systems. The decimal system was invented by Simon Stevin van Brugghe (1548-1620) and first published in a pamphlet, Be Thiende, in 1585. The French translation was entitled La Disme. Robert Norton's 1608 translation: Disme: The art of tenths, or, Decimal arithmetic introduced the idea to England. It was from these European roots that the concept of tenths, or "La Disme"anglicized later to "dime"immigrated to America. A Congressional resolution on July 6, 1785, adopted the dollar as the monetary unit of the United States. Subsequent resolutions spanning 1786 and 1787 specified weight, fineness and the decimal system for the relationship of each of the coins authorized. Adoption of the Constitution on September 17, 1787, reserved the right to coin money and regulate the value thereof to the Congress. This set the stage for passage of the Mint Act of April 2, 1792. This Act specified "...that the money of account of the United States shall be expressed in dollars or units, dismes or tenths, cents or hundredths and that all accounts in the public offices and all proceedings in the courts of the United States shall be kept and had in conformity to this regulation." Events moved swiftly from that point. On April 14, 1792, Washington appointed David Rittenhouse of Philadelphia, the most renowned scientist in America, Director of the Mint. Henry Voight, a well known clock maker, was appointed Acting Chief Coiner on June 1. Mechanics began construction of the necessary coining apparatus and "engines." On July 9, 1792, President Washington authorized proceeding with the coining of half dismes. No time was wasted, as just four days later, on July 13, 1792, Thomas Jefferson, then Secretary of State, recorded in his household account book: "rec'd from the mint 1500 half dimes of the new coinage." New research suggests that the single pair of dies used for these coins was designed and engraved by a British medalist, William Russell Birch, rather than the Robert Birch who was associated with the Mint in those early years and previously credited with the coin's design. Birch purportedly used letter punches supplied by Jacob Bay, a Germantown, Pennsylvania maker of printing types. The obverse of the half disme portrays the head of Liberty facing left, with the date 1792 below. The motto LIB.PAR. OF SCIENCE & INDUSTRY encircles the border. The reverse depicts an eagle flying left with the denomination HALF DISME in two lines, with a five pointed star in the exergue below. The legend UNI. STATES OF AMERICA frames the eagle. As the mint building was then under construction, the coining machinery was in the cellar of John Harper, a saw maker, at the corner of Cherry and 5th Streets, at which place these pieces were struck. On April 9, 1844, Dr. Jonas McClintock, a Treasury official, had a conversation at the Mint with Adam Eckfeldt, the retired Chief Coiner and only surviving Mint official who was actually present when the half dismes were made. Eckfeldt related that President Washington deposited $100 in bullion or specie for the purpose of coining these half dismes. Although the entire mintage of 1,500 was presented to Jefferson by Mint Director Rittenhouse, he obviously passed some on, for they were used by General Washington as presentation pieces for visiting dignitaries and VIPs. Many were given to acquaintances in Virginia, and no more were coined. 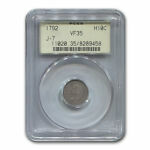 Breen estimates that the majority of these coins entered circulation with about 200-250 known today, generally in low grades. About 20 uncirculated examples are included in that figure. These coins were not fully struck up originally, so that even uncirculated examples will not show full breast or leg feathers on the eagle. The hair curls above and below Liberty's ear will also be partly flat. Adjustment marks are common and should not be considered a defect. Cast counterfeits are known. They can be identified by being heavier than authorized and having vertical rather than diagonally reeded edges. These coins are generally collected as patterns and are classified as Judd-7. As the prototype five-cent piece, the half disme was replaced in 1794 by the first regular issue half dime, the Flowing Hair type. President Washington, in his fourth Annual Address to Congress, November 6, 1792, spoke of "a small beginning in the coinage of half dismes, the want of small coins in circulation calling the first attention to them." A small beginning perhaps, but of great national significance, as the prerogative to coin precious metals has historically been an expression of national sovereignty. A period painting by John Ward Dunsmore of New York portrays General and Mrs. Washington, Alexander Hamilton and wife, Thomas Jefferson, David Rittenhouse, Tobias Lear, Henry Voight and Adam Eckfeldt inspecting these first coins. Because of this historic context, these diminutive pieces are among the most prized of American silver coins. Judd, J. Hewitt M.D., United States Pattern, Experimental and Trial Pieces, 7th Edition, Western Publishing Co., Racine, WI, 1982. Valentine, D.W., The United States Half Dimes, American Numismatic Society, New York, 1931. Stewart, Frank, History of the First United States Mint, Frank H. Stewart Electric Company, Philadelphia, 1924.